Brian Moore, Ph.D., Katharine Levit, B.A., and Anne Elixhauser, Ph.D. This Healthcare Cost and Utilization Project (HCUP) Statistical Brief presents data on the costs of hospital stays in the United States in 2012. 3 First, the distribution of hospital inpatient costs in 2012 by expected primary payer and type of hospital stay is provided. Second, growth in mean hospital costs between 2003 and 2012 is presented by type of hospital stay, patient age group, and expected primary payer. Finally, components of growth in aggregate annual hospital costs between 2003 and 2012 are provided. All differences between mean hospital costs noted in the text are statistically significant at the .001 level or better. Differences between proportions noted in the text differ by at least 10 percent. Of the $377.5 billion aggregate hospital inpatient costs in 2012, 46 percent was for Medicare-covered stays and 16 percent was for Medicaid-covered stays. Thus, patients covered by government payers accounted for at least 62 percent of all hospital costs. More than half of Medicare-covered and uninsured stays were medical (55 percent and 54 percent, respectively). More than half of stays covered by private insurance were surgical (52 percent). Maternal and neonatal stays constituted 27 percent of costs for Medicaid, 15 percent of costs for private insurers, and 4 percent of costs for uninsured patients. Mean hospital costs in 2012 were highest for surgical stays ($21,200)—2.5 times the mean costs for medical stays ($8,500) and nearly five times the mean costs for maternal and neonatal stays ($4,300). Patients aged 45-64 and 65-84 years had the highest mean hospital costs in 2012 ($12,900 and $13,000, respectively), but patients under age 18 had the highest growth in mean costs between 2008 and 2012 (more than 6 percent annually). Among payers of hospital stays, Medicare had the highest mean hospital costs in 2012 ($12,200), but between 2008 and 2012 mean Medicare costs grew at the lowest annual rate (0.9 percent). Average annual growth in aggregate hospital costs slowed from 5.2 percent in the 2003-2008 time period to 2.1 percent in the 2008-2012 time period. Figure 1 presents the aggregate hospital costs and total hospital stays by expected primary payer in 2012. In 2012, Medicare accounted for the largest proportion of hospital costs (46 percent) and hospital stays (39 percent). Patients with primary Medicare coverage accounted for 46 percent of the $377.5 billion in aggregate hospital costs in 2012. Private insurance was the second most common payer, accounting for 29 percent of total costs, followed by Medicaid with 16 percent of costs. 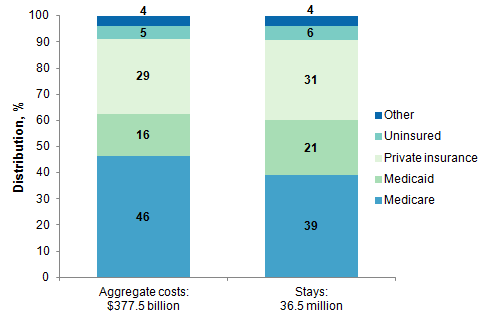 Stays of uninsured patients represented 5 percent of total hospital costs. In total, government payers (Medicare and Medicaid) accounted for at least 62 percent of all hospital costs. Patients covered by Medicare accounted for a larger proportion of aggregate hospital costs (46 percent) than of hospital stays (39 percent). In contrast, patients covered by Medicaid accounted for only 16 percent of hospital costs but 21 percent of hospital stays. 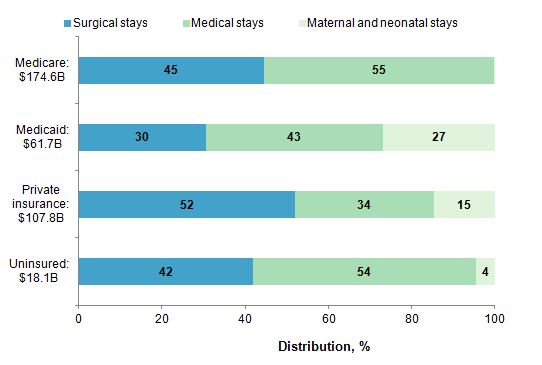 Figure 2 presents the distribution of costs by primary payer and type of hospital stay—surgical, medical, and maternal and neonatal—in 2012. In 2012, medical stays constituted the largest proportion of hospital costs for all payers except private insurance. Medical hospitalizations accounted for 55 percent of aggregate Medicare hospital costs, 54 percent of aggregate hospital costs for uninsured patients, and 43 percent of aggregate Medicaid hospital costs. Among privately insured patients, the highest proportion of aggregate hospital costs was for surgical stays (52 percent). Maternal and neonatal stays accounted for 27 percent of aggregate hospital costs for patients covered by Medicaid compared with 15 percent of aggregate hospital costs for privately insured patients and 4 percent of aggregate costs for uninsured patients. Table 1 presents mean hospital costs per stay in 2003, 2008, and 2012 by type of hospital stay, patient age group, and expected primary payer. The average annual percentage change from 2003 to 2008 and from 2008 to 2012 also is provided. All costs are inflation adjusted and expressed in 2012 dollars. Note: Data from 2008 were used as end points in both the 2003-2008 and 2008-2012 analyses. Mean hospital costs were highest for surgical stays and lowest for maternal and neonatal stays. In 2012, mean hospital costs per stay for surgical stays ($21,200) were 2.5 times the mean costs for medical stays ($8,500) and approximately five times the mean costs for maternal and neonatal stays ($4,300). Between 2003 and 2012, inflation-adjusted mean hospital costs increased for all types of stays. Between 2003 and 2008, annual cost growth ranged from 1.0 percent for maternal and neonatal stays to 2.0 percent for surgical stays. Between 2008 and 2012, annual cost growth was 3.8 percent for maternal and neonatal stays compared with 2.6 percent for surgical stays and 1.2 percent for medical stays. Between 2008 and 2012, growth in mean hospital costs per stay was highest for patients aged 17 years and younger. Mean hospital costs in 2012 were highest for patients aged 45-64 and 65-84 years ($12,900 and $13,000, respectively) and lowest for infants younger than 1 year ($5,000). Between 2003 and 2008, growth in inflation-adjusted mean hospital costs was relatively similar across patient age groups, ranging from 1.3 to 3.6 percent per year. From 2008 to 2012, average annual cost growth was more than 6 percent in the two youngest age groups and less than 2 percent in all adult age groups. Medicare-covered stays had high mean hospital costs but slow growth between 2008 and 2012. Mean hospital costs in 2012 were highest for hospital stays billed to Medicare: $12,200 compared with $8,100 for Medicaid-covered stays, $8,800 for stays for uninsured patients, and $9,700 for privately insured stays. Between 2003 and 2008, average annual growth in inflation-adjusted mean costs varied from 0.5 percent for stays for uninsured patients to 2.9 percent for stays for privately insured patients. Between 2008 and 2012, average annual cost growth exceeded 2 percent for patients covered by Medicaid (2.5 percent) and private insurance (2.4 percent) and for patients who were uninsured (3.5 percent); it was less than 1 percent for patients covered by Medicare (0.9 percent). Figure 3 presents the components of growth in aggregate hospital costs by type of stay for the 2003-2008 and 2008-2012 time periods. It differs from Table 1 in that it takes into account additional factors (inflation, changes in the number of stays per population, and population growth) that contribute to the increase in aggregate costs. In addition, Figure 3 decomposes the mean hospital costs per stay in Table 1 into mean costs per day and length of stay (LOS).4 Thus, growth in aggregate hospital costs was deconstructed into five components: population growth, change in number of stays per population, change in average LOS, growth in inflation-adjusted mean hospital costs per day, and inflation. Component-specific cost reductions are shown to the left of the center line (which denotes zero average annual growth), and component-specific cost increases are shown to the right of the center line. Overall growth in aggregate hospital costs (combining all five components) for each type of stay is shown in bold to the right of the bars. Notes: Average annual growth in length of stay was 0.1% for medical stays and for maternal and neonatal stays during the 2003-2008 time period. Data from 2008 were used as end points in both the 2003-2008 and the 2008-2012 analyses. Sources: Agency for Healthcare Research and Quality (AHRQ), Center for Delivery, Organization, and Markets, Healthcare Cost and Utilization Project (HCUP), National (Nationwide) Inpatient Sample (NIS), 2003, 2008, and 2012, and HCUP Methods Series Report #2014-02, Population Denominator Data for Use with the HCUP Databases. Figure 3. Factors accounting for growth in aggregate hospital costs by type of stay, 2003-2008 and 2008-2012. Figure 3 is a bar chart that shows the extent to which population growth, the change in number of stays per population, the change in average length of stay, growth in inflation-adjusted mean hospital costs per day, and inflation accounted for growth in aggregate hospital costs for all stays, for surgical stays, for medical stays, and for maternal and neonatal stays, for the 2003-2008 and 2008-2012 time periods. For 2003-2008, factors accounting for growth in aggregate hospital costs for all stays: length of stay, -0.2%; number of stays per population, -0.3%; population growth, 0.9%; inflation, 2.7%; inflation-adjusted mean hospital costs per day, 2.0%, for a total growth in aggregate costs for all stays of 5.2%. Factors accounting for growth in aggregate hospital costs for surgical stays: length of stay, -0.8%, number of stays per population, -0.2%; population growth, 0.9%; inflation, 2.7%; inflation-adjusted mean hospital costs per day, 2.8%, for a total growth in aggregate costs for surgical stays of 5.4%. Factors accounting for growth in aggregate costs for medical stays: number of stays per population, -0.3%; population growth, 0.9%; inflation, 2.7%; length of stay, 0.1%; inflation-adjusted mean hospital costs per day, 1.6%, for a total growth in aggregate costs for medical stays of 5.1%. Factors accounting for growth in aggregate costs for maternal and neonatal stays: number of stays per population, -0.5%; population growth, 0.9%; inflation, 2.7%; length of stay, 0.1%; inflation-adjusted mean hospital costs, 0.9%, for a total growth in aggregate costs for maternal and neonatal stays of 4.2%. For 2008-2012, factors accounting for growth aggregate hospital costs for all stays: length of stay, -0.2%; number of stays per population -1.9%; population growth, 0.8%; inflation, 1.4%; inflation-adjusted mean hospital costs per day, 2.0%, for a total growth in aggregate costs for all stays of 2.1%. Factors accounting for growth in aggregate costs for surgical stays: length of stay, -0.1%, number of stays, -3.0%; population growth, 0.8%; inflation 1.4%; inflation-adjusted mean hospital costs per day, 2.8%, for a total growth in aggregate costs for surgical stays of 1.7%. Factors accounting for growth in aggregate costs for medical stays: length of stay, -0.7%; number of stays per population, -1.2%; population growth, 0.8%; inflation, 1.4%; inflation-adjusted mean hospital costs per day, 1.9%, for a total growth in aggregate costs for surgical stays of 2.3%. Factors accounting for growth in aggregate hospital costs for maternal and neonatal stays: number of stays per population, -2.7%; population growth, 0.8%; inflation, 1.4%; length of stay, 1.2%; inflation-adjusted mean hospital costs, 2.6%, for a total growth in aggregate costs for maternal and neonatal stays of 3.3%. Source: Agency for Healthcare Research and Quality (AHRQ), Center for Delivery, Organization, and Markets, Healthcare Cost and Utilization Project (HCUP), National (Nationwide) Inpatient Sample (NIS), 2003, 2008, and 2012. A decrease in inflation and in the number of hospital stays per population drove a reduction in the rate of growth in aggregate hospital costs between the 2003-2008 and 2008-2012 time periods. Aggregate unadjusted (i.e., nominal) hospital costs for all stays grew from $269.5 billion in 2003 to $347.1 billion in 2008 (5.2 percent average annual growth). This growth was driven primarily by economy-wide inflation (2.7 percent per year), growth in inflation-adjusted mean hospital costs per day (2.0 percent per year), and population growth (0.9 percent per year). Aggregate unadjusted hospital costs increased to $377.5 billion in 2012, but between 2008 and 2012 the average annual growth of hospital costs slowed to 2.1 percent. This slowdown in overall cost growth was driven by a combination of lower inflation (1.4 percent annual rate) and a decrease in the number of hospital stays per population (-1.9 percent average annual change). Between 2008 and 2012, growth in aggregate hospital costs slowed the most for surgical stays and the least for maternal and neonatal stays. For surgical stays, the average annual growth in aggregate hospital costs slowed from 5.4 percent during the 2003-2008 time period to only 1.7 percent during the 2008-2012 time period. This decrease in cost growth was driven primarily by a 3.0 percent average annual decrease in the number of surgical stays per population as well as a more modest 1.4 percent inflation rate. The decline in cost growth of surgical stays may be due in part to the movement of simpler procedures to ambulatory settings. For maternal and neonatal stays, the average annual growth in aggregate hospital costs slowed somewhat (from 4.2 percent in the 2003-2008 time period to 3.3 percent in the 2008-2012 time period). Although the inflation rate declined and there was a 2.7 percent average annual decrease in the number of maternal and neonatal stays per population, growth in the average length of stay increased dramatically—from 0.1 percent during the 2003-2008 time period to 1.2 percent during the 2008-2012 time period. In addition, between 2008 and 2012 average inflation-adjusted mean hospital costs per day grew at nearly three times the rate experienced between 2003 and 2008 (2.6 percent vs. 0.9 percent). Revisions to the sample design—the NIS is now a sample of discharge records from all HCUP—participating hospitals, rather than a sample of hospitals from which all discharges were retained. Many hypothesis tests were conducted for this Statistical Brief. Thus, to decrease the number of false-positive results, we reduced the significance level to .001 for individual tests. DRGs comprise a patient classification system that categorizes patients into groups that are clinically coherent and homogeneous with respect to resource use. DRGs group patients according to diagnosis, type of treatment (procedure), age, and other relevant criteria. Each hospital stay has one assigned DRG. MDCs assign ICD-9-CM principal diagnosis codes to one of 25 general diagnosis categories. For this report, maternal hospital stays were identified using MDC 14 (pregnancy, childbirth, and the puerperium) and neonatal hospital stays were identified using MDC 15 (newborns and other neonates with conditions originating during the perinatal period). Surgical stays were defined as valid O.R. procedures on the basis of DRG coding principles. Stays other than maternal/neonatal stays or surgical stays were considered medical stays. The National (Nationwide) Inpatient Sample (NIS) is based on data from community hospitals, which are defined as short-term, non-Federal, general, and other hospitals, excluding hospital units of other institutions (e.g., prisons). The NIS includes obstetrics and gynecology, otolaryngology, orthopedic, cancer, pediatric, public, and academic medical hospitals. Excluded are long-term care facilities such as rehabilitation, psychiatric, and alcoholism and chemical dependency hospitals. Beginning in 2012, long-term acute care hospitals are also excluded. However, if a patient received long-term care, rehabilitation, or treatment for psychiatric or chemical dependency conditions in a community hospital, the discharge record for that stay will be included in the NIS. The unit of analysis is the hospital discharge (i.e., the hospital stay), not a person or patient. This means that a person who is admitted to the hospital multiple times in 1 year will be counted each time as a separate discharge from the hospital. Total hospital charges were converted to costs using HCUP Cost-to-Charge Ratios based on hospital accounting reports from the Centers for Medicare & Medicaid Services (CMS).7 Costs reflect the actual expenses incurred in the production of hospital services, such as wages, supplies, and utility costs; charges represent the amount a hospital billed for the case. For each hospital, a hospital-wide cost-to-charge ratio is used. Hospital charges reflect the amount the hospital billed for the entire hospital stay and do not include professional (physician) fees. For the purposes of this Statistical Brief, costs are reported to the nearest hundred. Annual costs were inflation adjusted using the Gross Domestic Product (GDP) Price Index from the U.S. Department of Commerce, Bureau of Economic Analysis (BEA), with 2012 as the index base.8 That is, all costs are expressed in 2012 dollars. Smaller sources of differences come from the inclusion in the NHEA of hospitals that are excluded from HCUP. These include Federal hospitals (Department of Defense, Veterans Administration, Indian Health Services, and Department of Justice [prison] hospitals) as well as psychiatric, substance abuse, and long-term care hospitals. A third source of difference lies in the HCUP reliance on billed charges from hospitals to payers, adjusted to provide estimates of costs using hospital-wide cost-to-charge ratios, in contrast to the NHEA measurement of spending or revenue. HCUP costs estimate the amount of money required to produce hospital services, including expenses for wages, salaries, and benefits paid to staff as well as utilities, maintenance, and other similar expenses required to run a hospital. NHEA spending or revenue measures the amount of income received by the hospital for treatment and other services provided, including payments by insurers, patients, or government programs. The difference between revenues and costs include profit for for-profit hospitals or surpluses for nonprofit hospitals. The Other group was dropped from results displaying differences by payer, with the exception of Figure 1, because of the difficulty interpreting results for such a heterogeneous group. The HCUP National (Nationwide) Inpatient Sample (NIS) is a national (nationwide) database of hospital inpatient stays. The NIS is nationally representative of all community hospitals (i.e., short-term, non-Federal, nonrehabilitation hospitals). The NIS is a sample of hospitals and includes all patients from each hospital, regardless of payer. It is drawn from a sampling frame that contains hospitals comprising more than 95 percent of all discharges in the United States. The vast size of the NIS allows the study of topics at the national and regional levels for specific subgroups of patients. In addition, NIS data are standardized across years to facilitate ease of use. HCUPnet is an online query system that offers instant access to the largest set of all-payer health care databases that are publicly available. HCUPnet has an easy step-by-step query system that creates tables and graphs of national and regional statistics as well as data trends for community hospitals in the United States. HCUPnet generates statistics using data from HCUP's National (Nationwide) Inpatient Sample (NIS), the Kids' Inpatient Database (KID), the Nationwide Emergency Department Sample (NEDS), the State Inpatient Databases (SID), and the State Emergency Department Databases (SEDD). Agency for Healthcare Research and Quality. Overview of the National (Nationwide) Inpatient Sample (NIS). Healthcare Cost and Utilization Project (HCUP). Rockville, MD: Agency for Healthcare Research and Quality. Updated July 2014. http://www.hcup-us.ahrq.gov/nisoverview.jsp. Accessed September 11, 2014. Moore B (Truven Health Analytics), Levit K (Truven Health Analytics), Elixhauser A (AHRQ). Costs for Hospital Stays in the United States, 2012. HCUP Statistical Brief #181. October 2014. Agency for Healthcare Research and Quality, Rockville, MD. http://www.hcup-us.ahrq.gov/reports/statbriefs/sb181-Hospital-Costs-United-States-2012.pdf. 1 Centers for Medicare & Medicaid Services. National Health Expenditures 2012 Highlights. http://www.cms.gov/Research-Statistics-Data-and-Systems/Statistics-Trends-and-Reports/NationalHealthExpendData/downloads/highlights.pdf. Accessed April 14, 2014. 2 Gonzalez JM. National Health Care Expenses in the U.S. Civilian Noninstitutionalized Population, 2011. Statistical Brief #425. November 2013. Agency for Healthcare Research and Quality, Rockville, MD. http://www.meps.ahrq.gov/mepsweb/data_files/publications/st425/stat425.shtml. Accessed April 22, 2014. 3 Estimates of cost in this Statistical Brief differ from the National Health Expenditure Accounts (NHEA) produced annually by the Centers for Medicare & Medicaid Services (CMS). These differences include the following: (1) HCUP covers only hospital inpatient treatment, whereas the NHEA include hospital outpatient treatment as well (emergency departments, outpatient clinics, and other outpatient departments); (2) HCUP excludes Federal, psychiatric, substance abuse, and long-term care hospitals, whereas the NHEA include those hospitals; and (3) HCUP is based on billed charges, which are converted to estimates of the costs of producing hospital services using hospital-wide cost-to-charge ratios, whereas the NHEA reports revenue or income. For more details, see How HCUP estimates of costs differ from National Health Expenditure Accounts in the Definitions section. 4 Average annual growth in inflation-adjusted mean hospital costs per day in Figure 3 was 2.0 percent for both time periods. The average annual change in length of stay for both time periods was -0.2 percent, a slight decline. These two numbers combined reflect the average annual change in inflation-adjusted mean hospital costs shown in Table 1 (1.8 percent). 5 Agency for Healthcare Research and Quality. HCUPnet Web site. http://hcupnet.ahrq.gov/. Accessed September 11, 2014. 6 Barrett M, Lopez-Gonzalez L, Coffey R, Levit K. Population Denominator Data for Use with the HCUP Databases (Updated with 2013 Population Data). HCUP Methods Series Report #2014-02. August 18, 2014. U.S. Agency for Healthcare Research and Quality. http://www.hcup-us.ahrq.gov/reports/methods/2014-02.pdf. Accessed September 11, 2014. 7 Agency for Healthcare Research and Quality. HCUP Cost-to-Charge Ratio (CCR) Files. Healthcare Cost and Utilization Project (HCUP). 2001-2011. Rockville, MD: Agency for Healthcare Research and Quality. Updated August 2014. http://www.hcup-us.ahrq.gov/db/state/costtocharge.jsp. Accessed September 11, 2014. 8 U.S. Bureau of Economic Analysis. National Income and Product Account Tables, Table 1.1.4 Price Indexes for Gross Domestic Product. http://www.bea.gov/iTable/iTable.cfm?ReqID=9&step=1#reqid=9&step=1&isuri=1. Accessed March 20, 2014. 9 Sun Y, Friedman B. Tools for More Accurate Inpatient Cost Estimates With HCUP Databases, 2009. Errata added October 25, 2012. 2012. HCUP Methods Series Report # 2011-04. October 29, 2012. Rockville, MD: Agency for Healthcare Research and Quality. http://www.hcup-us.ahrq.gov/reports/methods/methods.jsp. Accessed August 22, 2014. 10 For additional information about the NHEA, see Centers for Medicare & Medicaid Services (CMS). National Health Expenditure Data. CMS Web site May 2014. http://www.cms.gov/Research-Statistics-Data-and-Systems/Statistics-Trends-and-Reports/NationalHealthExpendData/index.html?redirect=/NationalHealthExpendData/. Accessed October 9, 2014. 11 American Hospital Association. Trend Watch Chartbook, 2014. Table 4.2. Distribution of Inpatient vs. Outpatient Revenues, 1992-2012. http://www.aha.org/research/reports/tw/chartbook/2014/table4-2.pdf. Accessed October 9, 2014. Internet Citation: Statistical Brief #181. Healthcare Cost and Utilization Project (HCUP). May 2016. Agency for Healthcare Research and Quality, Rockville, MD. www.hcup-us.ahrq.gov/reports/statbriefs/sb181-Hospital-Costs-United-States-2012.jsp.